A warmer climate is setting the stage for more intense wildfires. Hotter temperatures dry out trees and plants faster, making them more flammable. These conditions leave forests drier than usual, making them more susceptible to catching fire, even outside of summertime. The federal government now regularly spends multiple times more fighting fires than it did just twenty years ago. Firefighters are gearing up for the task by mobilizing more resources and manpower and improved forest management. The levels of future wildfire activity is correlated with future warming. 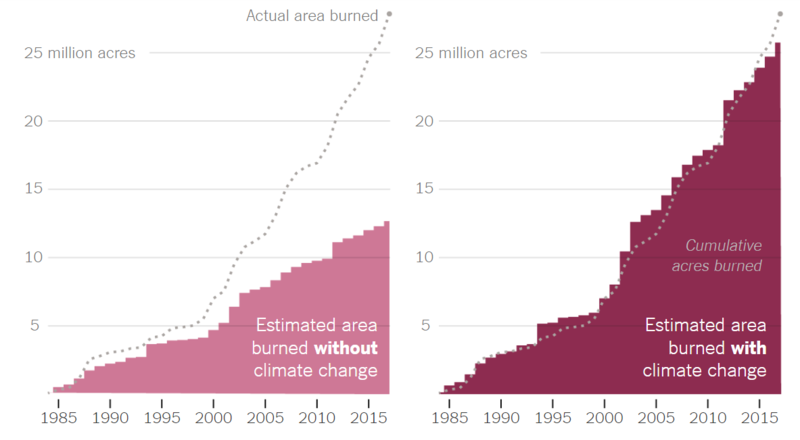 The National Climate Assessment (2018) found that climate change effectively doubled the total area burned in the Western United States since 1985. Lance Cheung, U.S. Department of Agriculture. The New York Times. Climate Change Is Fueling Wildfires Nationwide, New Report Warns. The Story Group. Unacceptable Risk — Firefighters on the Front Lines of Climate Change.